The HiRISE camera aboard NASA's Mars Reconnaissance Orbiter captured this image of Phoenix landing on Mars, with its parachute deployed. For space enthusiasts, May 25 is a lucky day. On that day in 1961, President John F. Kennedy served Congress a pledge to put a man on the moon. Sixteen years later, the first Star Wars film hit theaters. 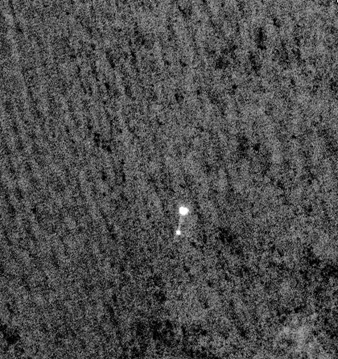 This year, at 7:38 p.m. Eastern Time, NASA’s Phoenix spacecraft landed near the icy northern pole of Mars. Fifteen minutes later, word of the safe landing reached Earth. Mission controllers at the Jet Propulsion Lab in Pasadena, Calif., Lockheed Martin Space Systems in Denver, Colo., and the University of Arizona in Tucson all cheered. 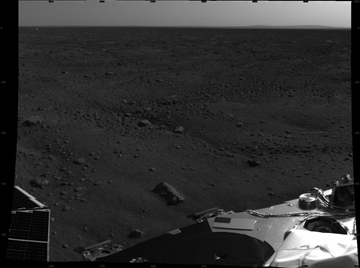 Almost immediately, the spacecraft began sending back images of the Mars surface. “I couldn’t be happier to be here to witness this incredible achievement,” said NASA Administrator Michael Griffin from Pasadena. Phoenix’s touchdown ended a 680-million-kilometer journey that began at Cape Canaveral, Fla., last August. Solar panels powered the golf cart-sized probe during most of its flight. But batteries took over on Sunday, as the craft sped into the Martian atmosphere at more than 19,300 kilometers per hour. Friction slowed the craft enough for its parachute to open, and small rocket thrusters provided the final brakes. Two hours after the landing, mission team members confirmed that the probe’s permanent solar array had unfolded flawlessly. With its camera and weather station also in place, Phoenix stands ready to begin its mission. This view of Mars' surface is a mosaic of several images taken by Phoenix in its first hours on the red planet. The probe has two broad research targets: the history of water in the Martian arctic and the biological potential of the ice-soil boundary. NASA scientists say that its findings will advance NASA’s mission to understand the planet’s climate, geology and possible life history — and to prepare for human exploration. Sometime this week, controllers plan to burrow the craft’s 2.3-meter-long robotic arm into the frosty soil of the Vastitas Borealis region. The arm will dig up samples for its on-board chemistry labs to analyze. Scientists hope the results will reveal whether the subterranean ice ever thaws and whether key organic compounds are buried within the dirt. Both questions are critical in assessing the planet’s capacity to sustain life. The lander will leave at least one lasting memento. Along with its complex instruments, the craft carries a miniature DVD fashioned to last well into the next millennia. The Phoenix DVD, developed by the Planetary Society, contains salutations from Arthur C. Clarke and Carl Sagan, plus segments from H. G. Wells’ War of the Worlds, Ray Bradbury’s The Martian Chronicles and other works of science fiction. The project is “nothing less than a message from our world to one centuries away,” says the Society’s Web site. Alas, Star Wars did not make the cut.